Originally named 'West Kirby Presbyterian Church of England', the work of West Kirby URC began in 1882 with a desire to see the Good News about Jesus preached and heard in the up and coming township of West Kirby. What followed was a time of prayerful and enthusiastic growth, rooted in the faith of a relatively small group who were determined to let people hear about how Jesus' death had enabled everyone to be in relationship with God. After an initial period of rapid expansion (resulting in 3 extensions to the building in just over eight years! ), members of the church supported six 'church plants', including at Heswall, as well as supporting a Temperance Mission and the foundation of a children's convalescent home. At the same time, there was considerable interest in supporting overseas mission work and a desire to see missionaries sent out from the Church. This was accomplished in the coming years and West Kirby URC continues to support international missionary links today. Rev. 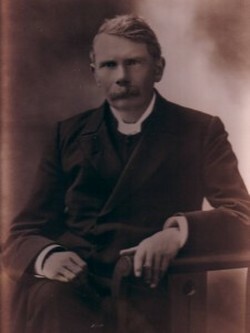 Patrick Kirkland was ordained as the Church's first minister in 1887 and ministered at West Kirby for 40 years. Find out more about the history of the church by following the links to download Old Roots, New Beginnings, the transcript of an illustrated talk on the history of the church, and These Five & Twenty Years, a booklet commemorating the church's early history. Photograph of the church's war memorial windows and choir window, taken by Ole Hansen and shared with permission.